Broom is not easily confused with other wild plants on this web site. During the months of May and June, this deciduous shrub announces the arrival of summer by producing golden, almond-scented spikes of peaflowers on wiry branches all over Ireland. 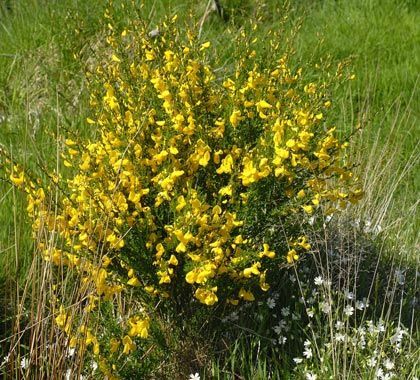 Not unlike the more familiar Gorse, Broom is however without spines. The bright yellow 25mm long flowers are sometimes marked with red. After pollination the stamens protrude from between the upper part of the flower and the keel, which is the lower part. The leaves are lanceolate and trefoil on long, five-angled wiry stems. The fruit is a flattened, oblong pod which turns black when it's ripe and bursts on warm, sunny days. This is a native plant belonging to the family Fabiaceae. I was first introduced to this wonderful shrub in the 1950's in Glenmalure in Co Wicklow and I photographed it in 2006 at Trooperstown, Co Wicklow. 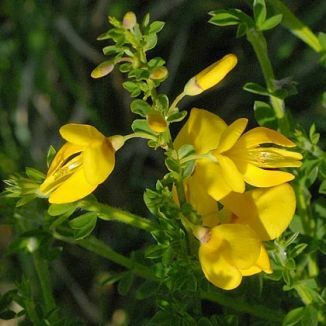 17th century apothecary Nicholas Culpeper wrote that Common Broom was 'good in dropsies'.